Would you like to know some quick fix in order to make your website load faster? Would you like your users to have a better experience on your website? One answer to that is what we call a CDN. Content Delivery Network (CDN) is a system of distributed servers that deliver content to a user based on various criterias such as geolocation. And the good news for you is that Matomo (Piwik) got recently integrated to a popular CDN: CloudFlare. As previously said, CloudFlare is a content delivery network (CDN). With the integration of Matomo (Piwik) to CloudFlare, you can now deploy the Matomo tracking code directly through your CloudFlare account instead of tweaking the source code of your website. Click “install” to finish the setup. The Matomo (Piwik) tracking code is now installed on each page of your website. If you have previously added the tracking code manually to your website and now use the Matomo (Piwik) app, don’t forget to remove the tracking code from your website. Otherwise you end up tracking every user twice. Important note: the Matomo Cloud (formerly Piwik Cloud)Flare integration only concerns the Matomo (Piwik) tracking code integration. For the Matomo app on Cloudflare to work you will need to have a running Matomo installed on your server, or you can start a free trial on the Matomo Analytics (formerly Piwik Analytics) Cloud. 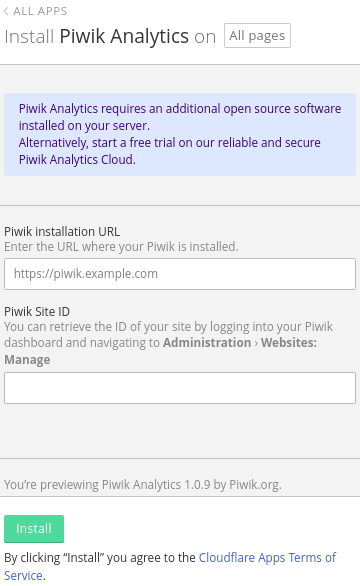 To learn more about what Matomo (Piwik) integration to CloudFlare can do for you.